Cactus are seen as plants of the desert, and indeed they do grow in dry climates. They are a varied group, and many are well suited to growing in containers of in general landscaping applications. They range from low growing, small ground cover plants, to large shrubs and trees, so exactly what are they? With over 2000 species cacti can provide us with tremendous variety. If you spend much time watching old westerns on television then you will probably picture them as Saguaro Cactus, the tall tree like cactus from the old west. Increasingly popular with gardeners for the fascinating shapes and colours, these plants also fruit and some are edible. Most are fairly well behaved garden plants, others can be a little difficult to contain, the ‘prickly pear’ being one such species. All cacti are succulents, and are members of the Cactaceae family, they are also mostly spiny succulents. 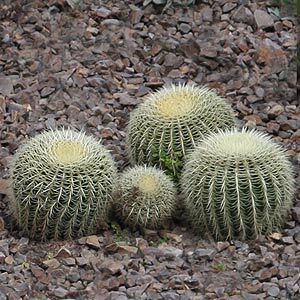 The ‘Golden Barrel Cactus’, pictured right are Echinocactus grusonii, is one of the easiest species to regognise, and very popular with gardeners. It forms an attractive rounded barrel shape, an interesting addition to a dry garden. Growing conditions for Cacti or Cactus and Cacti care. Cacti do not grow in desert sand, but they are are well and truly adapted to dry conditions and hot sun. 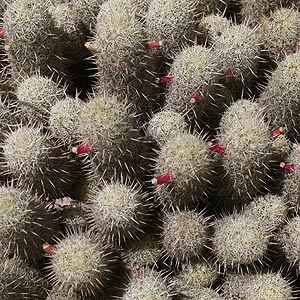 They do require good drainage, some species such as as : Acanthocereus, Disocactus, Rhipsalis, Epiphyllum, Hatiora, Hylocereus, Lepismium, Schlumbergera, and Selenicereus require a little more water, and a little less light than others. For a complete list of CACTI NURSERIES visit our cactus nurseries page.